The little town is built amphitheatrically between and on-top of two hills, on the southern side of the Navarino bay; Sphacteria Island (a huge rocky barrier 4.6 km long and rising to a height of 135 m.) protects the bay. - the hexagonal fortress of Neokastro dominating the western side of the city. For visitors and travelers it's a chance to spend the holidays cultural as "sports" and thus enjoy the many excursions and hiking. Pylos was frequently mentioned in history and Mythology, is a famous ancient name. 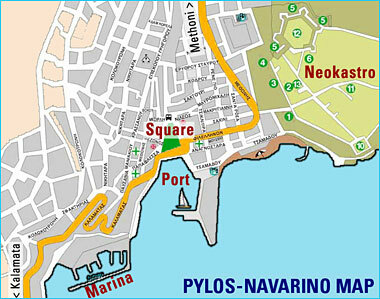 Pylos has a continuous historical presence since pre-historic times. Pylos was the dominant Mycenaean center in Messenia. • the Mycenaean Pylos (bronze-age ~ -1300 / -1200 B.C.) called also Sandy Pylos or Homer's Pylos is supposed the capital of Nestor's Kingdom (from Homer's Odyssey), is located at Epano Englianos (nearby Hora). In 1939 archaeologists discovered and excavated there a Mycenaean palace known as the Palace to Nestor, it seems the site itself was called Pylos. • the Classical and Hellenistic Pylos (~ -700 / +600) was probably situated on the rocky promontory now known as Koryphasion at the northern edge of the bay of Navarino, close to Voidokilia Bay. Through the centuries Pylos continued to attract, Byzantines, Franks, Venetians and Turks each in turn fortified the high points along the bay. • in 425 BC. 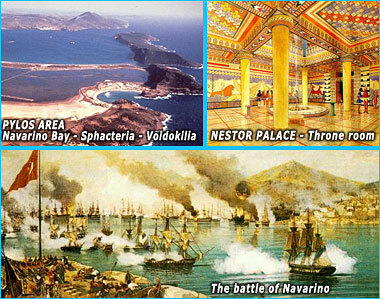 during the Peloponnesian War, a naval battle took place in the bay between Athens and Sparta. • in October 20, 1827 the naval battle of Navarino took place, where fleets English, Russian and French inflicted on the fleet turco-egyptian a defeat which would be decisive for the independence of Greece in 1832 (it follows this battle that diplomacy has decided the establishment of an independent Greek state).